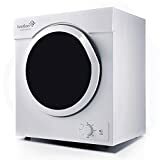 If you’re constantly moving, living in a small studio apartment or just plain short on space a compact dryer can become an essential household item. You can save yourself from boring weekend laundromat visits and rather do all your washing and drying at home. 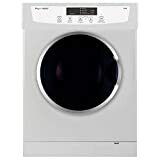 You may have concerns about the convenience, space and maintenance of a compact dryer but these items on our list are built for regular use as well as convenience. They are all mobile and require minimal installation system so that they can be used in apartments, dorms and houses and moved as needed. The Panda Compact Laundry Dryer comes in two sizes, one is 8.8 lbs and 2.65 cubic feet and the other is 13.2 lbs and 3.75 cubic feet. In terms of appearance, Panda is designed to give you the traditional dryer look. However, unlike standard household dryers, this is smaller and lighter to be carried and moved anywhere easily. Panda has a stainless-steel drum and a transparent porthole window in the front. You can anytime see the machine operating, without stopping the cycle. Unlike the usual machines that are 220v, Panda is 110V, requiring a double drying time. After drying, it keeps the room slightly heated as warm air comes out of it. So far, Panda has been known for durability and portability. It also allows you to mount the dryer on the wall with a mounting kit included in the set. 8.8lbs capacity /2.65cu.ft. And 13.2lbs capacity/3,75 cu. ft.
Just like any other portable dryer, Ivation is also small and compact but what makes it different from others is its capacity. With a drying power of 1,500 watts and capacity of 3.21 cubic feet, it can dry up to 26 pounds of clothes at one time. The machine saves time and electricity by offering 7 dry settings; 30 min, 60 min, 2.5hr, Airing, Mix, Standard, Extra so you choose as per your convenience. With minimum drying noise, Ivation can be installed anywhere including condos, dorms, rooms, RVs and townhomes. There are installation hassles, all you do is plug the dryer and connect the vent and spin your clothes to dry while you continue your other chores. If you are tired of using the public dryers and need something personal and effective, Ivation can be your first ever dryer. As the name says, CTT is an efficient and fair deal with a 3.5 cubic foot and 13-pound capacity and 1300 watts power drive. The dryer is made up of a stainless steel inner drum and high-classtechnology that keeps your clothes soft and tangle free. With a clockwise and anti-clockwise drying system, CTT saves times and energy up to 10% as compared to other drying machines. A further interesting component of this dryer machine is its high-temperature cycle that can kill up to 99.99% of household germs and bacteria in your clothes, without having to use harsh chemicals and toxicants. The auto dry integrated thermostat monitors and controls the drying temperature so that the fabric is not damaged from frequent and heated drying. If you are looking for a dryer that can dry beyond fabrics, then this isn’t your take. Note that the CTT cannot dry items that are made of rubber or have rubber pads. 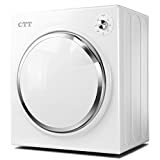 CTT is an effective machine with multimode installation; so, you can either place it side by side in your house with a compact washer, stack it in your apartment or wall mount it. The Costaway Electric Tumble Dryer adds durability with its unique design and stainless-steel tub. The machine weighs 57.2 pounds, so in comparison to others, its slightly smaller, lighter and more portable. It’s very suitable for small apartments, RVs, dorms and townhouses. The Costaway has 1500W power and a capacity of 27lbs/3.21 cubic feet. The machine offers easy controls for setting drying time. Unlike the other dryers that some complain are too noisy, the Costaway has minimal noise so you can sleep, communicate or work while Costaway is doing its job. This Pinnacle Dryer 860 is both efficient and compact. 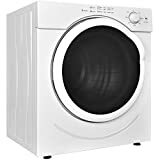 If you have been searching for a dryer that fits into your space or doesn’t occupy much space but equally work great, this is it. It has all the essential features of an ideal compact dryer; pauseson command button, wrinkle protection and child lock protection. To cater to all kinds of fabrics, Pinnacle also features 3 sensor drying levels; extra dry, normal dry and damp dry. The above portable and compact dryers are one of the best choices in terms of their performance and price. You can choose the best option for you to meet your drying and lifestyle needs. 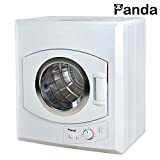 If you are mostly travelling then you must choose the one that easily mobile and light in weight and we recommend to you Panda 2.65 cu.ft Compact Laundry Dryer. If you have kids in the house and have experienced noisy dryers in the past, the Costway Electric Tumble Dryer is a good option you can invest in. If you prefer quality drying, don’t intend to move on a regular basis and have a lot of clothes to dry consider the larger capacity Ivation Compact Portable Dryer. If you talk about the price range, they all vary slightly and don’t make a lot of difference to your pocket.